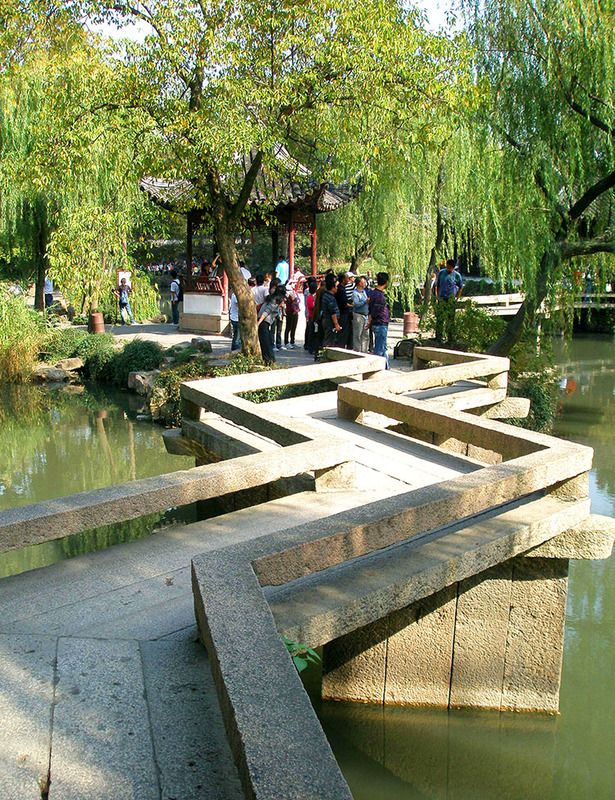 The zigzag bridge is a common feature in classical Chinese gardens. According to local lore (and tourist guides!) zigzag bridges and paths are said to confound evil spirits that can only walk straight lines for whatever reason! But in actual fact, these bridges are mainly decorative features based on the the Zen principle of mindfulness. Their non linear construction forcing one’s attention on the here and now…….and slowing one’s pace just enough to take pleasure in each element of the skillfully cultivated landscape around. Do check out my post on the canals and gardens of Suzhou. And while you are there you might want to spare a moment to admire the genius of I M Pei. Happy travels………..no matter where life takes you. The shape is contrary to what I would have expected in a Chinese or oriental garden. It’s modernistic and yet appealing. Have a great weekend, Madhu. Thank you. I am surprised there aren’t more such bridges from China actually! Interesting concept, indeed. It would provide a challenge to cyclists.or the inebriated! I LOVE classical Chinese Gardens. Yuyuan in Shanghai is a great example, but lots of places in Chengdu, too, like Wenshu Park. I posted a link to the Yuyuan above, but the zigzag bridge there was heaving with people, so I didn’t get a good enough shot. The Suzhou gardens are gorgeous with several on the UNESCO list. We have a zigzag in one of our gardens here in San Diego but for the life of me I can’t remember where. I remember zigzagging across it, though, and thinking how cool it was. Yeah, but I just can’t remember where. If I could remember where, I could find the pictures. Truly, it’s a marvelous bring, and it shows that concrete can be used effectively aesthetically. It is. And I am a fan of stark concrete slabs in landscape architecture too Sally. Their simplicity is the perfect contrast to the colour and fluid shapes of the natural elements. True, and these gardens have so many cultivated view points that you wouldn’t want to miss at all! 🙂 Have a fun weekend Imelda. very true, informative and important. Great presentation! Happy you think so. Thank you Mihrank. Gosh! I should watch out for these… I’m sure to land in the water… Zen in quite another fashion. Hmm… I wonder what the Sufi thinks about this? Fascinating! … and why do spirits walk the straight line (shortest path from point A to B)? Pretty smart of them, I’d say! By the way – where’s your new background shot? Thanks Meredith. My background is back on popular demand! 🙂 Bama pointed out to me that the old one was showing cropped on his screen, which I assume is wider than most. So I put in a temporary background until I could process a copy of the right resolution. You have been rather quiet. Hope your winter is treating you well. I have been a bit absent, haven’t I? I am trying to keep up with everyone, though I’m struggling with posting and chatting. This move back has been challenging all around and I haven’t really established a happy routine, especially in this winter … I’m well, though, and that’s the most important thing! When are you off to Africa? Living in Singapore for many years, I still did not know the history behind the zig zag bridges . Nice to stop by your post. I too love to travel and write my experiences. Would love to market hop with you Veena. Thank you for your visit and comment. Looks like a beautiful place to be too! It is Indah. There are several other gardens even more beautiful. And quite a few of those are UNESCO heritage sites. It is special Marianne. Seems distinctive to us, but not uncommon in China and Japan. Glad you think so Divz. Thank you for stopping by to comment. I’m pretty sure I visited the same bridge when I was in Suzhou! The zen explanation makes sense to me. Lovely pic! It certainly does, compared to the spirit story 🙂 Appreciate your visit and comment Isbergamanda. It is, the link is right at the beginning. Very! 🙂 Thank you for stopping by Ian. Thank you very much Dilip. I love the whole idea of this. Much more interesting than a straightaway too! Far more aesthetic isn’t it? Thank you Margie, a pleasure to see you here. Great choice for the challenge Madhu. Thanks for the explanation for the use of non-linear planning. This is fabulous I love this garden and the bridge. I like the idea of slowing your pace to really focus on what’s around you. If those twists and turns weren’t there, how easy would it be to just zip thru and not see the beauty nature offers. Lovely photo, Madhu. I love the intricacy of Chinese gardens. They are so lovely! Me too Nicole. The region around Shanghai seems to have the nicest ones. hmmmm no wonder i could not cross .. it thought i was the devil.. This is really interesting, Madhu. I like the idea very much, and also the title of, “Humble Administrator.” 🙂 The graceful Willow trees make a beautiful backdrop to the zigzag bridge, and also remind me of a house we once had on the bank of river which was edged with these lovely trees. Your old house by the willow lined river sounds lovely! Do you have photos of it on your blog? I am always intrigued by the similarities AND the differences between Chinese gardens and their descendants, Japanese gardens. I loved this view of Suzhou, probably the one place in China I am sorry to have missed. And I loved your juxtaposition of I.M. Pei’s Museum in his home town. Now I am going to look up I.M. Pei’s Museum in Japan that I muzzily remember having seen a great deal about, and being totally struck by. Your posts are so extraordinary, you explain things so clearly and link together things seemingly disparate but that then you connect. I was sorry I missed Pei’s Miho museum near Kyoto on my visit. It looks lovelier than the one in Suzhou. Fantastic entry for the zigzag challenge! Wonderful 🙂 I would never have guessed the concept behind the design. Extraordinarily beautiful!. I love the design…you always impart something new…thanks Madhu!